And in this corner ladies and gentleman, we have the reining heavyweight champion of Hokkaido, Mt. Meakan. 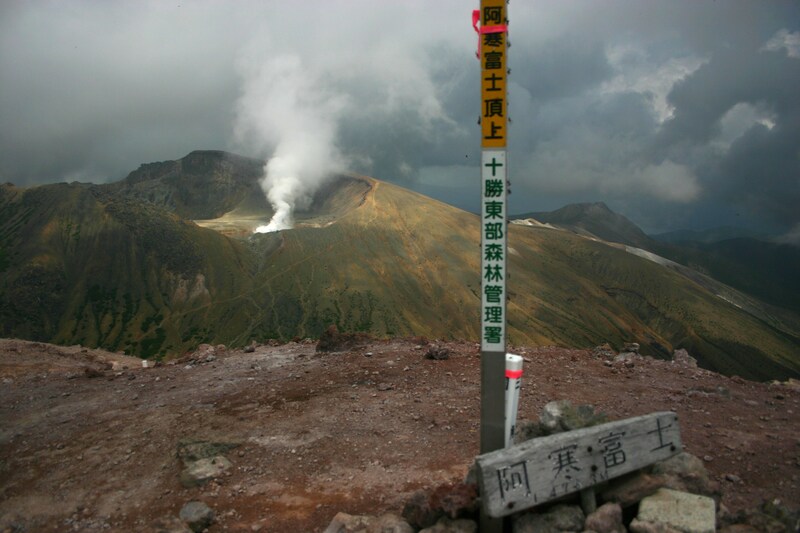 Weighing in at 1499m, the active stratovolcano hasn’t lost a bout since erupting in a steamy fury back in the spring of 2006. And the challenger for this weekend’s fight is no other the champion’s half-sister Mt. Oakan. 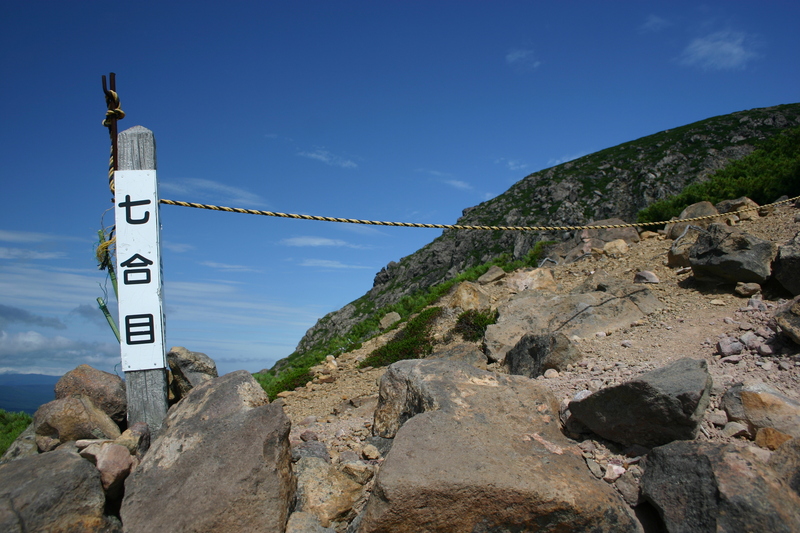 Stepping into the ring at 1371m, the dormant volcanic monster is looking to regain the title after losing recognition back in 1964 due to Kyuya Fukada’s legendary book thrusting Meakan into the spotlight. Officiating tonight’s feature presentation is no other than Akan-fuji, the cylindrical gatekeeper to the secrets of Akan. 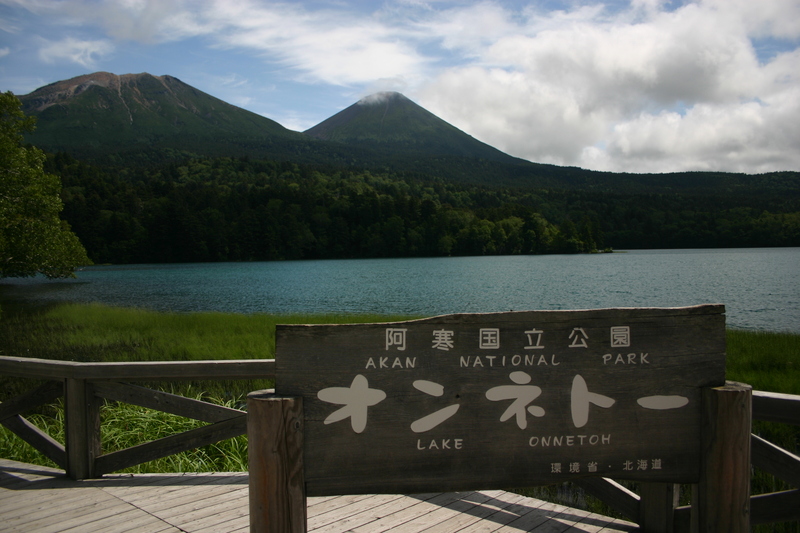 Akan-fuji has the advantage of being able to see the battle of both peaks from a safe viewing distance, as the two stalwarts duke it out for the dubious distinction of crown jewel of Akan National Park. So, will it be the challenger Oakan, thirsty for a rematch, or reigning champion and steam spewer Meakan? 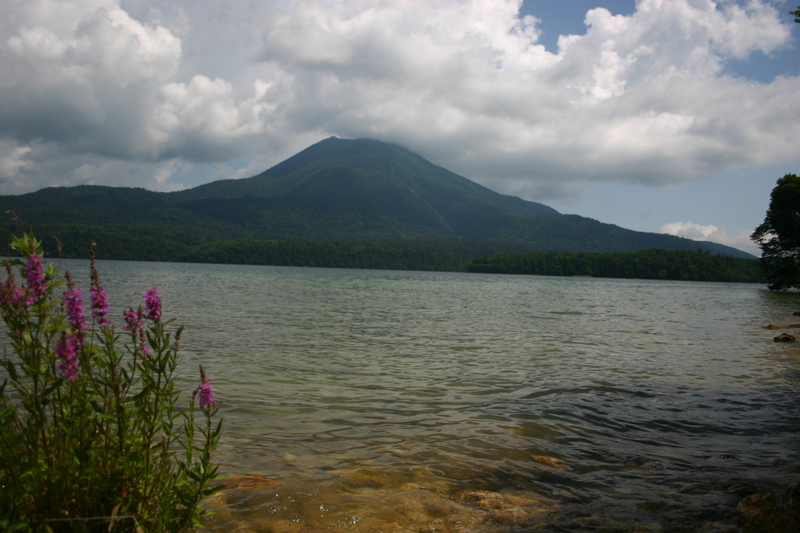 The clouds hung heavy over Meakan’s cylindrical figure most of the morning, as I neutrally observed from Lake Onneto. 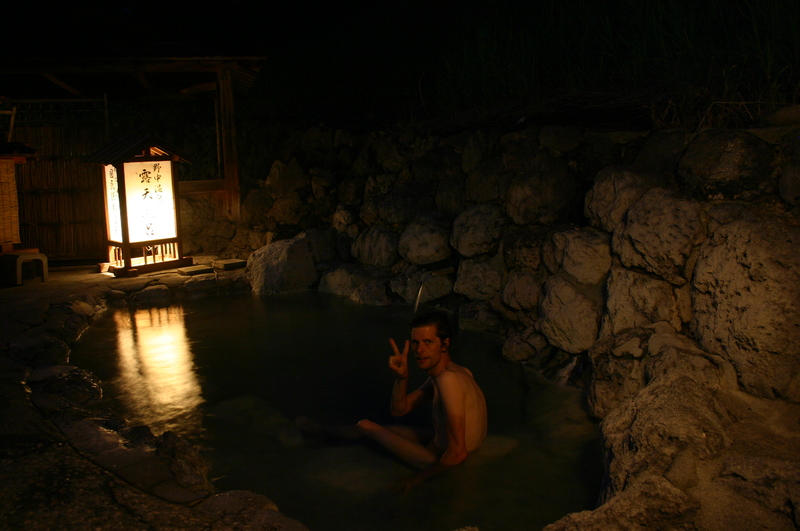 After a wonderful lunch of butterbur at the amazing cafe near the campsite, I headed back to Nonaka hot spring to check into my lodging, drop off the gear, and enjoy a leisurely afternoon in the baths. 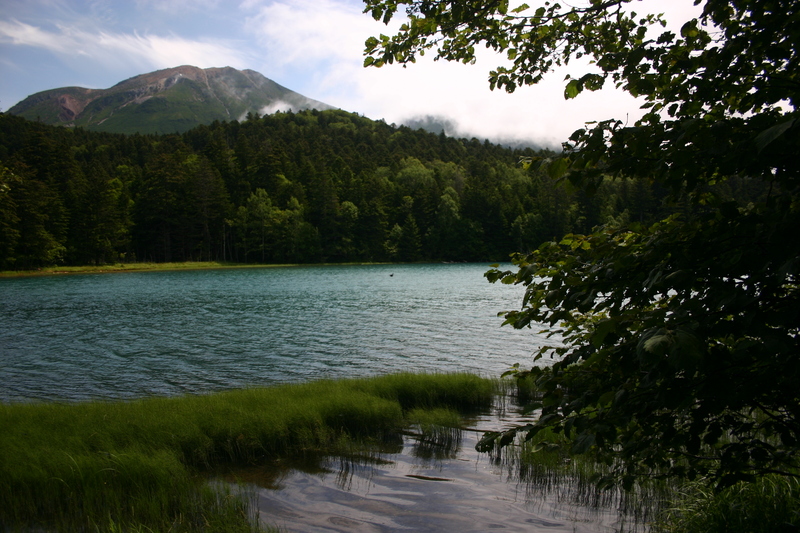 Suddenly, as if on cue, the clouds lifted, revealing the phenomenal scenery amidst the emerald waters of the lake. 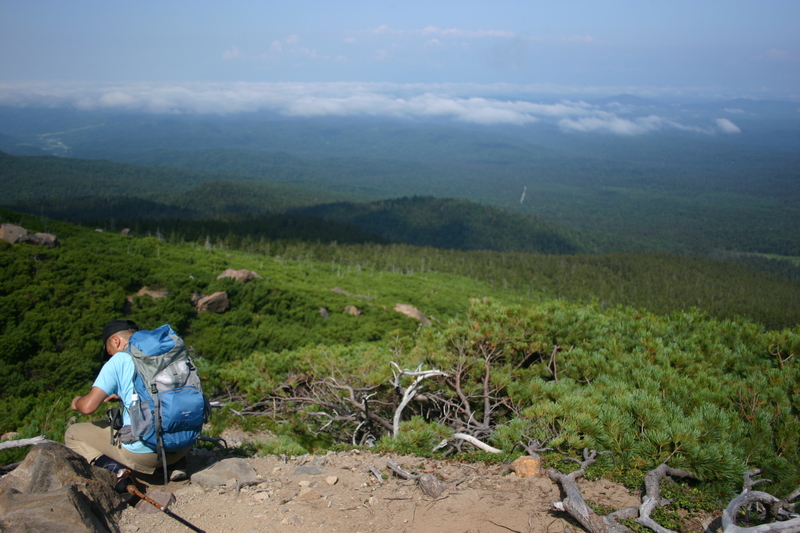 “I’ll just have a quick look while the weather is good,” I muttered to myself, knowing my friend Yusuke was in route to Akan to join me in a summit attempt the following morning. This was much steeper than I’d initially remembered. 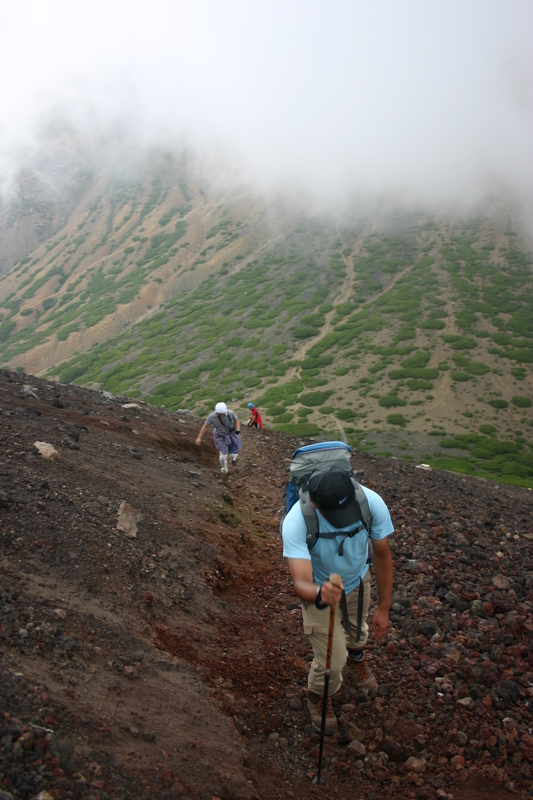 Back during my Hyakumeizan challenge, I’d confidently strode up these volcanic walls as if on a leisurely stroll through the park and rightfully so: I had Rishiri, Rausu, and Shari as “warm-up” hikes. This time around sweat poured down my slowly advancing body, with plenty of abu (horseflies) thrown in for good measure to ensure any breaks were short-lived. “I’ll just head up to the tree line to scope out the path…”. Famous last words indeed. I took my first break at the 7th stagepoint. 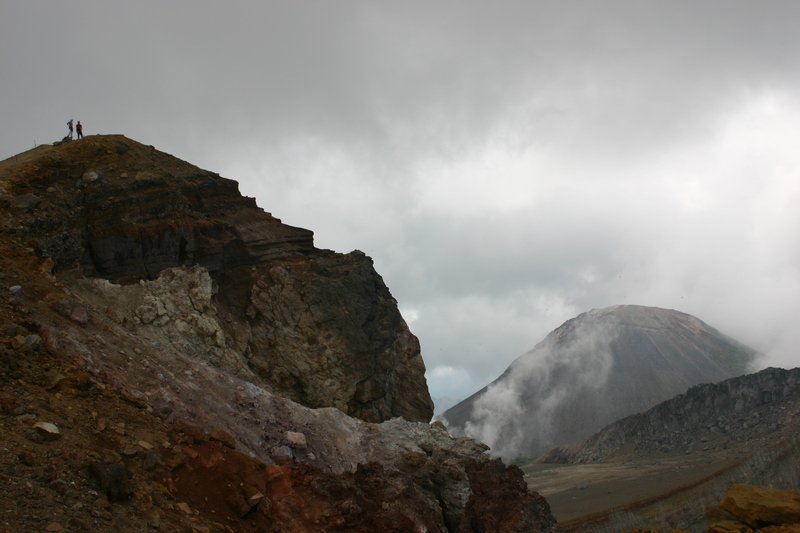 Sweat flowing freely, I glanced up at the volcanic rocks towering directly above. I could clearly make out the 8th and 9th stagepoints, a seemingly easy toss from my current vantage point. The blue sky called to me as my own mother would. “Come closer”, it beckoned. I soon found myself staring down into the hissing crater of Meakan’s fiery summit. What in the world was I doing here? Wasn’t I supposed to climb the peak tomorrow? It would have been a shame to climb this far without going to the summit, so onward I went. The clouds pushed their way in with every advancing step and I soon lost the views. Meakan was putting up its first fight in the battle for supremacy. I’d lost all chance of viewing Akan-fuji’s wonderful figure in the thickening mist. 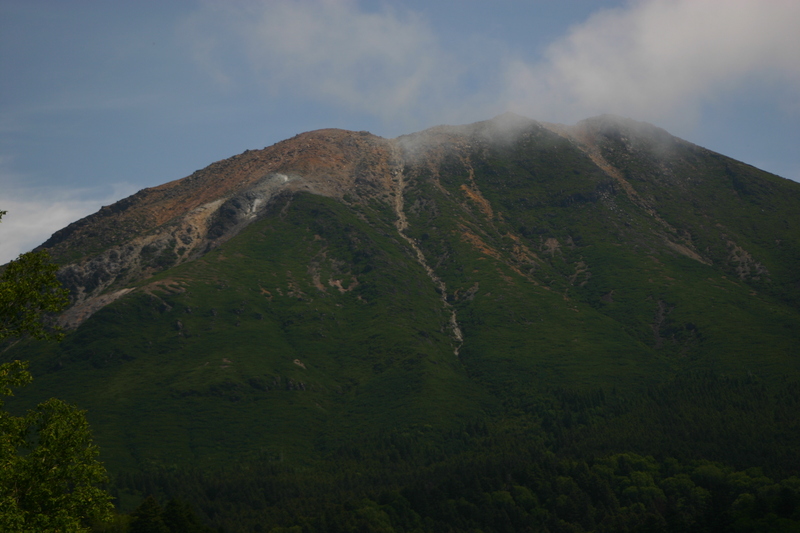 I’d had even worse views than the first time I’d climbed, so I silently and quickly retreated back the way I’d come, not even bothering with a break until I’d reached Nonaka hot spring. I collapsed in the bath, a victim of the volcano’s tumultuous slopes. The next morning I packed the bags and met Yusuke in the parking lot, with revenge on my mind. The two of headed back up the path I’d scaled the previous afternoon. I filled the tour guide role quite easily, explaining each part of the trail as if I were a seasoned veteran. Thankfully we took a much more relaxed pace for the morning ascent, taking well-timed breaks at each signpost. Meakan had a few more tricks up its sleeve, vying for my attention and making a strong case for retaining the title. For one, the cloud continued to push in, and we’d have no idea if there would be any views until reaching the crater at the 9th stagepoint. 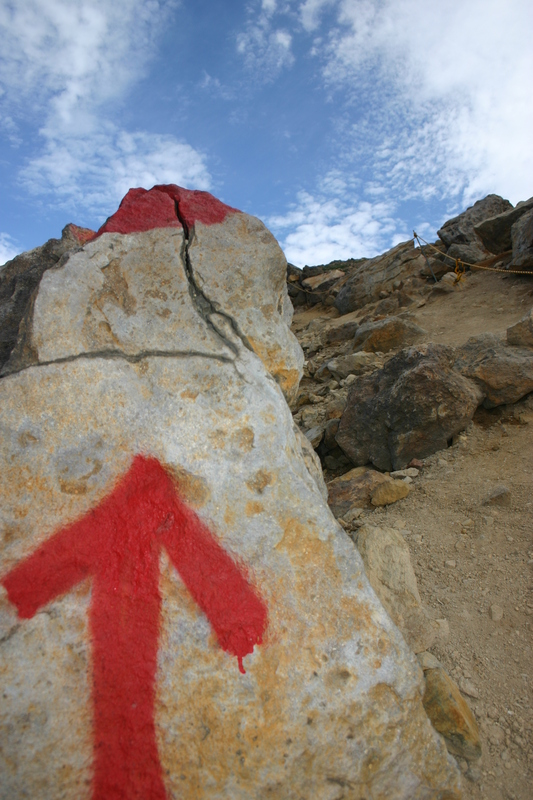 We slogged on, as optimistically as we could with a huge climb ahead of us. Cloud swallowed us completely at the 70% mark, as I threw up my arms in disbelief. Robbed of a view two days running! There was nothing left to do but push on in silence. As Yusuke boiled water for coffee, something miraculous happened. 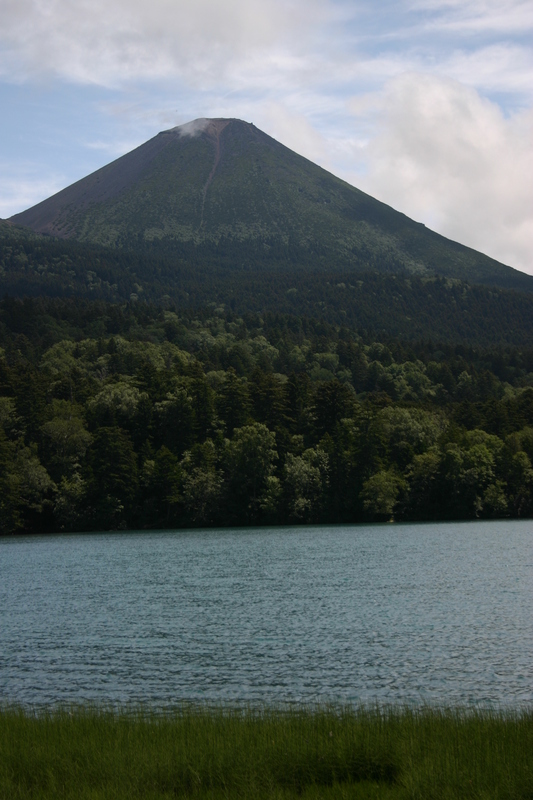 As if starting a performance, the clouds parted, revealing Akan-fuji’s conical figure. Perhaps Meakan had thrown enough punches for one weekend…. 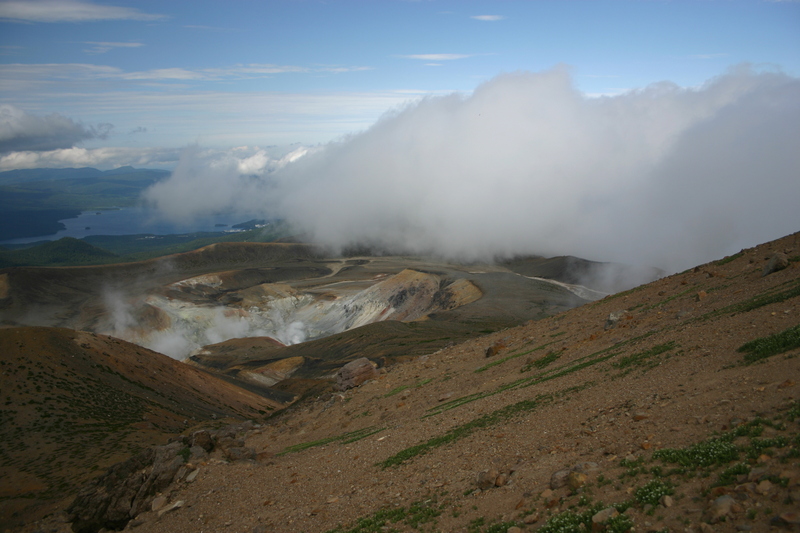 After a strong cup of coffee, we raced around the crater rim, dropping to the base of Akan-fuji. “Let’s do it”, I yelled, fueled by the caffeine and anticipation of a great view. Once again, the clouds swirled around us, cutting off the views behind. Reaching the peak in a little over 20 minutes (the guidebook said to allow an hour), we once again collapsed among the summit rocks. 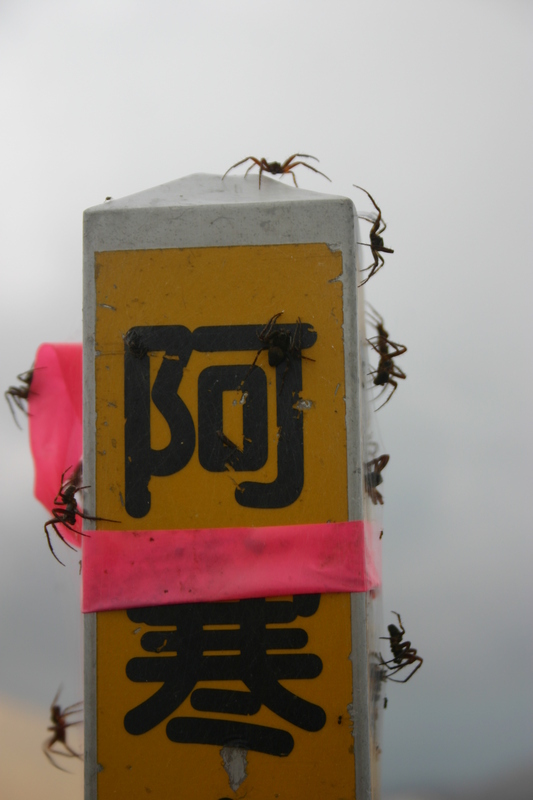 The signpost, for some very strange reason, was absolutely covered with scary-looking arachnids. This was definitely an omen. In the calm, still August air we sat silently, patiently waiting to see if the clouds would part. Since this was a title fight and Akan-fuji was referee, we knew it’d only be a matter of time. Luckily the wait was short. Even though we were robbed of a view of the Kushiro wetlands, the unobstructed panorama of Meakan was enough to call our mission a success. 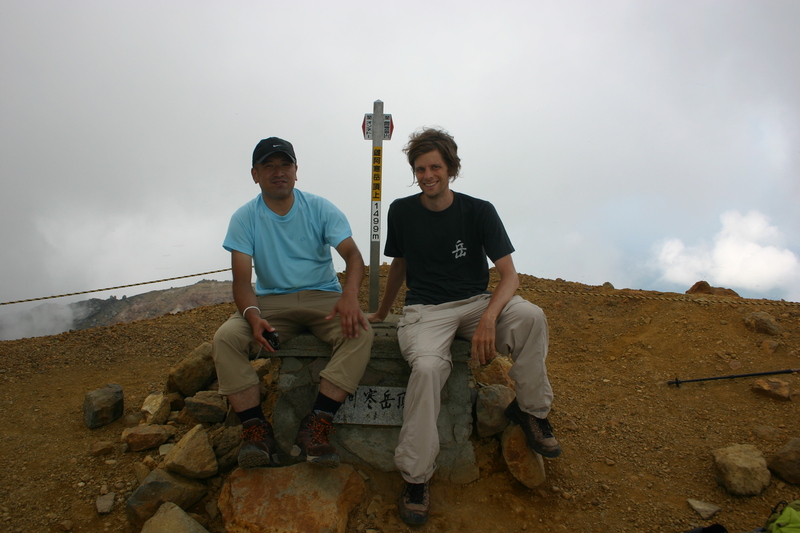 Yusuke and I flew back down to the tree line and over to the shores of Onneto. We passed through the campsite, following a trail around the northern edge of the emerald lake when we heard a rumble. “Either Meakan is starting to belch, or a storm is approaching”, I proclaimed. The rumbling came closer and closer as we pushed through the dark, deserted forest. Bear bells dangling from our packs, the two of us marveled of the beauty of Meakan’s densely forested base. Suddenly, the skies erupted, as if the clouds were emptying their bladders on the earth. Despite being in the forest, the trail quickly became a river and lighting thrashed all about. Coming in 2 or 3-second intervals, the rumble was constant. Strikes within a kilometer of where we were walking were not uncommon as we prayed that no hikers were above the treeline. Eventually we made it back to the parking lot, completely soaked and quite chilly from the cold rain. After a quick bath, Yusuke dropped me off at Lake Akan, where round 2 of the battle would commence the following morning. Meakan put up one heck of a fight, demanding our undivided attention in the epic battle for champ. I nervously wondered how Oakan would respond…..